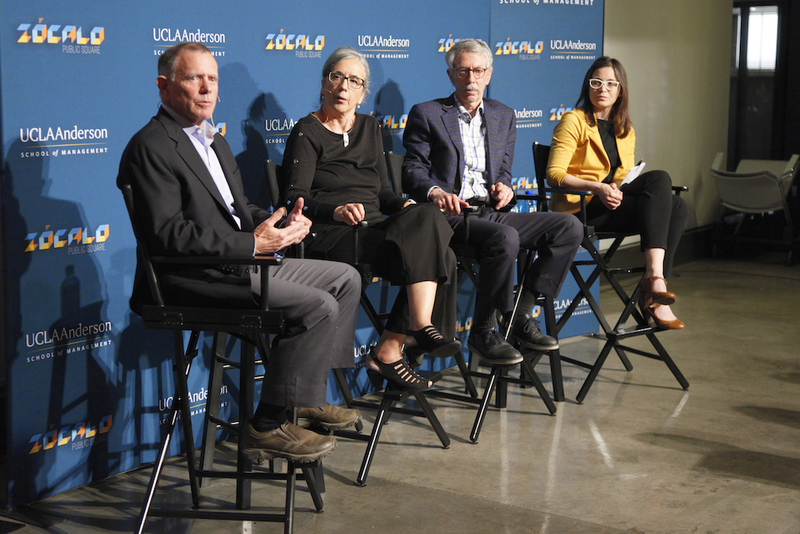 While the standard definition of a recession is two consecutive quarters of negative GDP growth, UCLA Anderson economist and statistician Ed Leamer asked the audience to think of it in another way. He defined an economy in an unhealthy state, as “a period of unwanted idleness: idleness of labor in the form of unwanted unemployment rates, idleness of factories … idleness of office buildings with unused offices, idleness of apartments with vacancies. Such idleness is a dangerous sign for which we must look and is something [we] should all worry about,” he said. 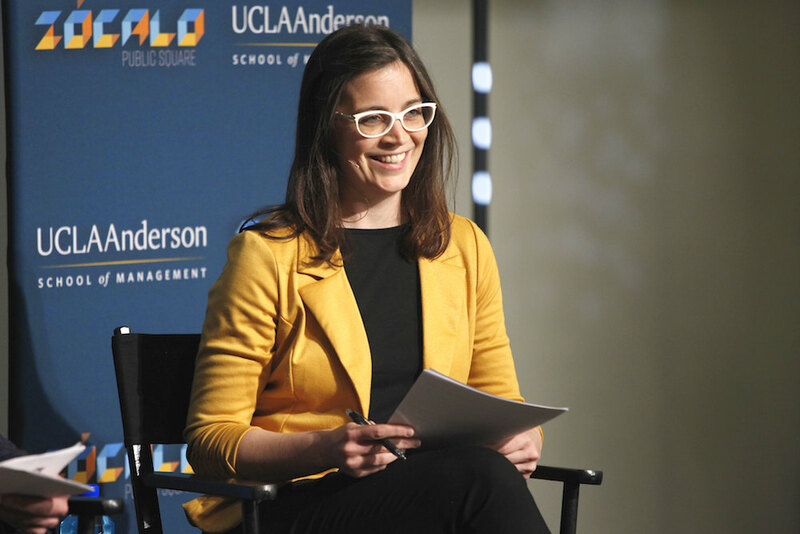 In response to a question from the evening’s moderator, Los Angeles Business Journal managing editor Erica E. Phillips, Leamer said that fragile housing markets are firm indicators of economic downswings—nine out of the eleven recessions since World War II, Leamer explained, have been related to the housing market. But the current housing market is not showing signs of fragility. So Leamer put America’s current risk for recession at around 15-20 percent. Jerry Nickelsburg, UCLA Anderson Forecast director, said he fears our federal government, with its “unprecedented budget deficits” and “unprecedented borrowing in a time of full employment,” presents a particularly significant risk. If the American economy does go through another downturn, this deficit will almost certainly balloon to unforeseen heights, Nickelsburg said. The government also has failed to prepare for the additional strain on the social programs that a new recession will produce. 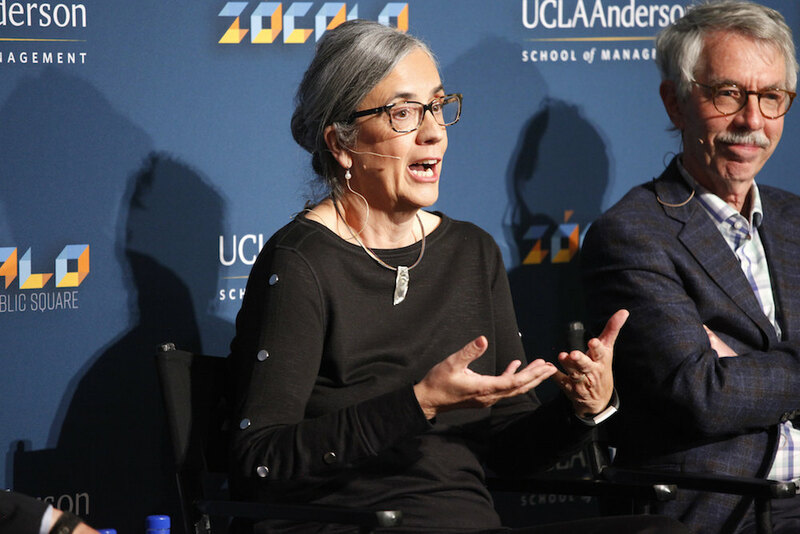 UC Riverside economist Gloria Gonzalez-Rivera urged the audience to look beyond America’s own borders because, “Recessions can be exported and recessions can be imported.” With Europe experiencing a rough patch and Brexit putting England’s economy—the second largest in Europe—at risk, Americans also must anticipate economic shocks that can come from overseas. The possibility of a trade war with China or Europe could also spark a recession in the U.S., Gonzalez-Rivera said. But what about average Americans? Are they better equipped to deal with a recession than they were in 2007? Nickelsburg has seen some encouraging signs—savings rates are up and there has not been any worrisome housing stress. But just as the amount of debt the U.S. government holds is a major concern, so is the personal debt of average Americans. In particular, student loan debt—which does not go away in a bankruptcy—puts many young Americans at risk. So, what can the average American do to prepare for the next recession? Leamer urged the audience to assess their own personal job risk. The question of whether or not Americans will be ready to deal with elevated unemployment is a difficult question to answer. And in the next recession, many could see their jobs lost to artificial intelligence. However, Leamer believes that we can increase our own job security by ensuring that the intelligence we bring to the labor market is not the artificial intelligence of computers, but intelligence that is wise, creative, and analytical. And while the hospitality industry has not always been hit hard by a recession—“bars do really well in recessions,” Nickelsburg quipped—the next downturn could deeply impact hotels and restaurants because there are now robots who can easily and efficiently do a lot of the hospitality work once handled by humans. It’s the subset of Americans in these types of lower-wage industries that Gonzalez-Rivera is particularly concerned about. 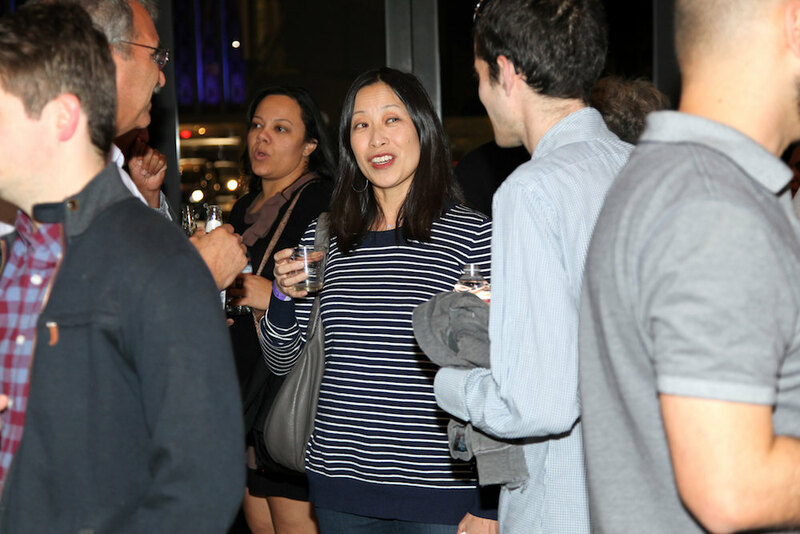 She roughly calculated that an excess of 40 million American households—or around 100 million people—have a current net worth of less than $10,000. So when a recession does hit, these Americans will not have much savings to get through tough times. “We have to think about the recession not in the abstract, but [in terms] of how many lives are at stake,” Gonzalez-Rivera said. Jerry Nickelsburg, UCLA Anderson Forecast director, said he fears our federal government, with its “unprecedented budget deficits” and “unprecedented borrowing in a time of full employment,” presents a particularly significant risk. Is California any better prepared than the rest of the U.S.? Since the last recession, California has put away billions of dollars into rainy-day funds. And while these rainy-day funds might not necessarily be enough to cushion a loss in state tax revenues after an economic downturn, California is in a better position than it was before the Great Recession. That said, California faces deeper threats from a possible trade war with Asian countries, as California is the center of Asian imports and exports in the U.S. The logistics industry—which moves goods and services that are traded—accounts for around 7 percent of the employment in California, Nickelsburg estimated. Logistics has experienced significant growth in areas like the Inland Empire that were hit hard economically between 2007 and 2009. A trade war would threaten that growth, but in a recession, the logistics industry could insulate the regions where it is large against future recession. However, Leamer describes California’s current budget system as “fiscal child abuse.” He is very concerned about what he called the excessive borrowing throughout all levels of government in California to fund pensions and health care. “Future taxes,” he said, “will have to be higher,” and it’s the young people of America who will have to pay these taxes. “The future doesn’t look good,” Leamer said. “We need to have forward-looking politics. 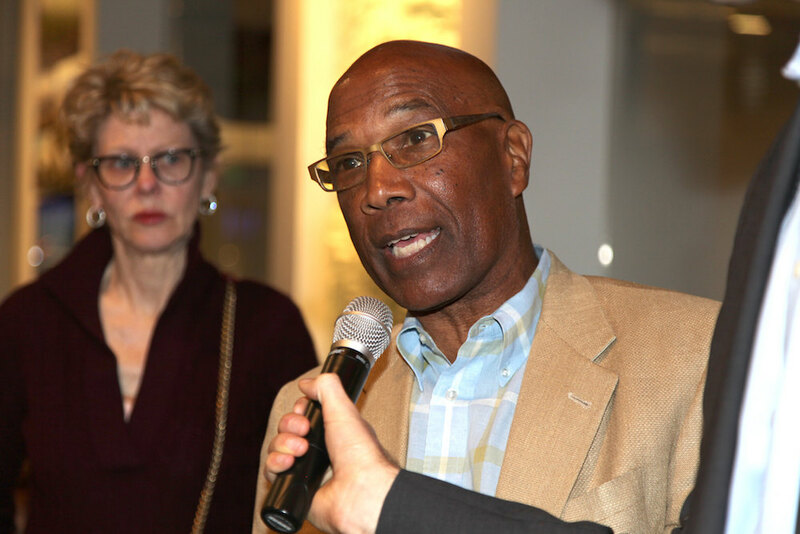 We need to think about what this country will be like or should be like 20 years from now, not tomorrow or the day after.” This mindset would ensure that the America future generations inherit is fiscally sound. Kianoosh Hashemzadeh is associate editor at Zócalo Public Square. 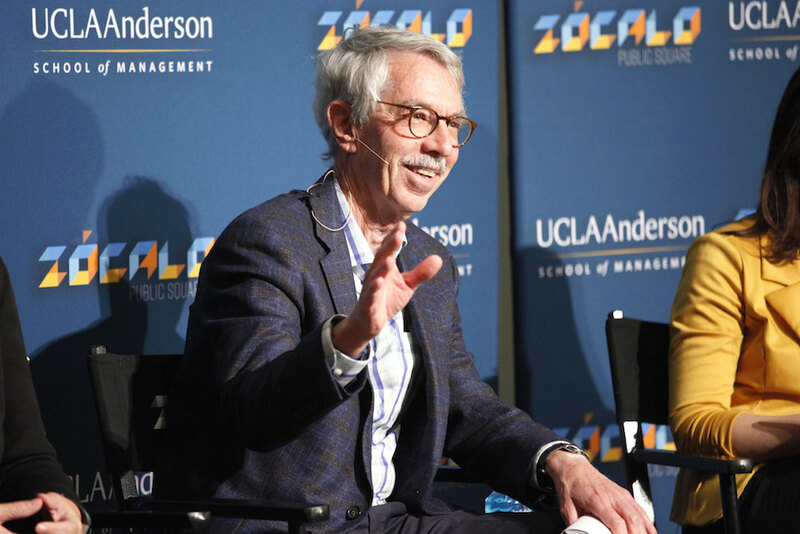 UCLA Anderson economist Ed Leamer at Zócalo/UCLA Anderson. 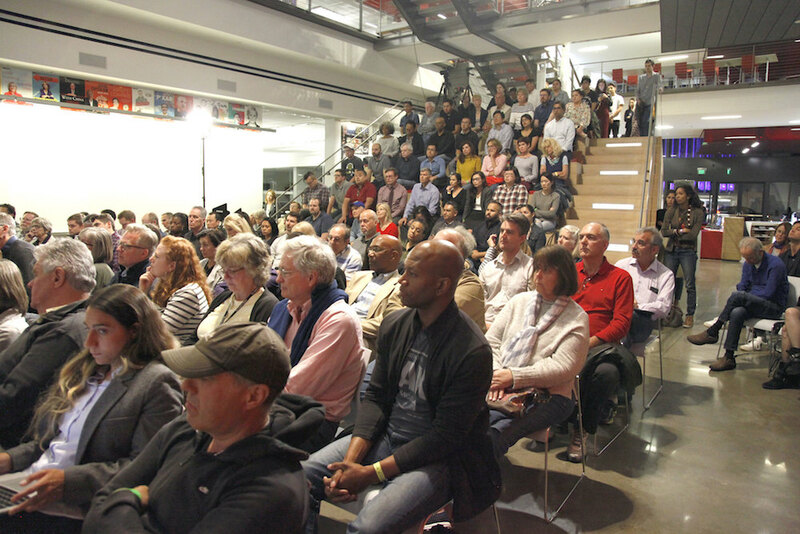 An overflow crowd at Gensler in Los Angeles. 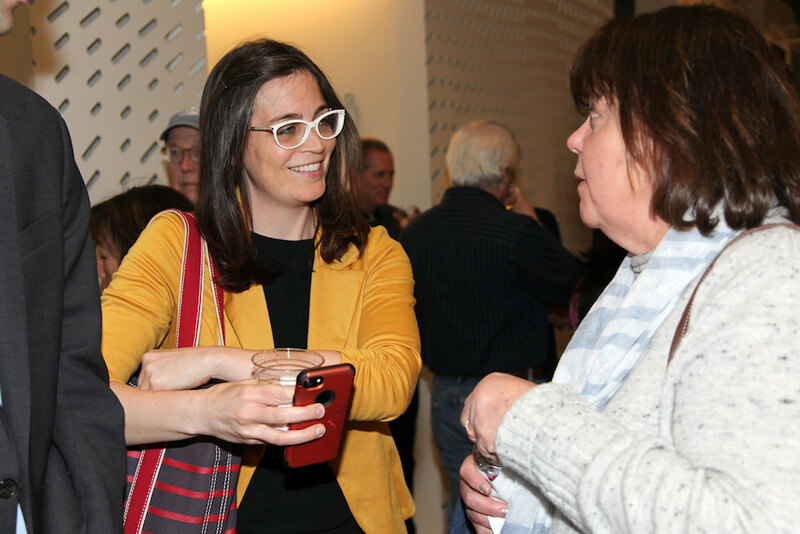 Los Angeles Business Journal managing editor Erica E. Phillips speaks with guest at the reception.